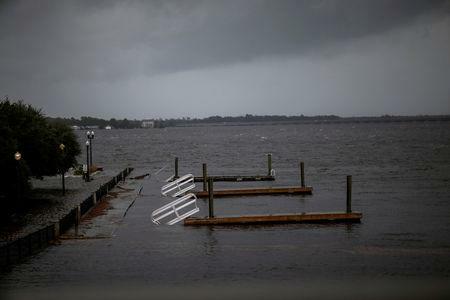 WILMINGTON, N.C. (Reuters) - Florence crashed into the Carolina coast on Friday, felling trees, dumping nearly three feet of rain on some spots and leading to the death of four people before it was downgraded to a tropical storm still capable of wreaking havoc. In Pender County, North Carolina, a woman suffered a fatal heart attack; paramedics trying to reach her were blocked by debris. A fourth victim was killed in Lenoir County while plugging in a generator, according to the governor's office. As of Friday morning, Atlantic Beach, a town on the state's Outer Banks barrier islands, had received 30 inches (76 cm) of rain, the U.S. Geological Service said. 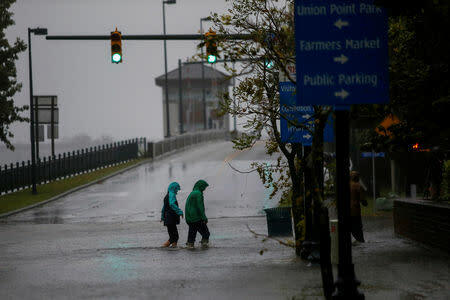 The centre of the hurricane's eye came ashore at about 7:15 a.m. EDT (1115 GMT) near Wrightsville Beach close to Wilmington, with sustained winds of 90 miles per hour (150 kph), the National Hurricane Center (NHC) said. 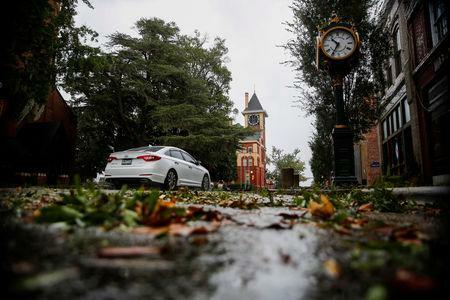 Authorities in New Bern, a town of about 30,000 people that dates to the early 18th century, said more than 100 people had to be rescued from floods. The downtown area was underwater.Calls for help multiplied as the wind picked up and tide rolled in, city public information officer Colleen Roberts said. "These are folks who decided to stay and ride out the storm for whatever reason, despite having a mandatory evacuation," she said. "These are folks who are maybe in one-story buildings and they’re seeing the floodwaters rise." Governor Cooper said the state would arrange a visit by Trump "at an appropriate time." A tree crashed into Kevin DiLoreto's home in Wilmington, where all roads leading to his neighbourhood were blocked by fallen trees. "It's insane," he said by telephone. "I've never seen tree devastation this bad. "Afterwards, I'm going to drink a bottle of whiskey and take a two-day nap, but right now I'm walking the neighbourhood making sure my neighbours are fine because nobody can get in here." More than 722,000 homes and businesses were without power in the Carolinas early on Friday, utility officials said. Utility companies said millions were expected to lose power and restoration could take weeks.